Opening TKC's London season by way of a pre-recording event, before going into the studio next morning to record Mozart's Sacred Music for Hyperion, Robert King brought his enlarged forces (too many TKC musicians to fit onto the platform of their former home in Wigmore Hall) to the rather grand Cadogan Hall by Sloane Square, a relatively new addition to London's concert venues. It suited this programme which, however, didn't catch fire until the second half, and suffered by comparison with the OAE/Wallfisch mixed programme the previous night, that period band quoted by Evening Standard judiciously as being 'quite possibly the finest' etc. 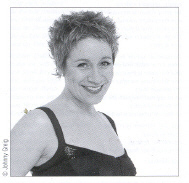 A nice flexible voice, though one without great individual character, and a winning platform appearance, Carolyn Sampson did her best with the several motets, but didn't quite find the necessary flair to put over the famous Alleluia of K165. Best was the more operatic Regina Coeli, K108, by the ambitious 15-year old composer. Odd to see Robert King gesticulating on a podium like a 'proper' conductor! I am more familiar, and comfortable, with him directing smaller ensembles from the harpsichord. No problems with K338 this time, except for the large string body's tendency to overwhelm the baroque woodwinds at the back; might they sound better brought nearer the front of the platform? We are never far from one or another Mozart anniversary, and this seems to be the beginning of a Mozart project to follow TKC/Hyperion's pioneering re-discoveries of little known sacred music by Purcell, Vivaldi and Monteverdi? Time will tell whether there are commensurate Mozart riches yet to be unearthed at this late stage, bearing in mind that the Complete Works of Mozart in boxed sets are widely available inexpensively? * "the leading British soprano of her generation"? Re. Carolyn Sampson a correspondent writes: We heard her ENO Semele and Pamina last year – good as both (and she has looks on her side) but by no means outstanding. There are several other British sopranos I can think of with an equal or better claim to being the best of that generation (+/- 5 yrs) – e.g. Rosemary Joshua, Emma Bell or Sally Matthews for that sort of repertoire. A similar quote, from Gramophone, " the best British early music soprano by quite some distance" appears on the Hyperion web site. Carolyn Sampson does have wide experience and a good list of recordings, so perhaps the criterion applying is quantity not quality …. Whilst hype in publicity material is legitimate, even if it may ultimately be counter-productive, there is a disturbing tendency for it to invade with increasing frequency what should be factual information in programme notes for concerts and recordings - e.g. a new DVD of Les Paladins begins the introduction to the opera in the booklet (which you would be reading only after purchase) with rave quotes from Evening Standard and The Times - prejudging ("pre-judicing"?) viewers own freedom to respond. Gramophone, from its position as "The world's unrivalled authority" tells its readers annually which are the best six outstanding discs of the year. Does such spoon-feeding guide its readers usefully, or misleadingly? Upon my initiative, Music Web abandoned obligatory star awards with their CD reviews, deciding instead to trust visitors to the site to read the critiques and form their own judgements to decide what to purchase. Few of Gramophone's six "best" feature amongst Musical Pointer's most enthusiastic recommendations! Comments on these topics welcomed? January 2006 -The Hyperion CD of this concert has now been released. 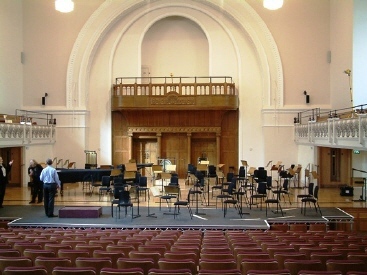 Cadogan Hall was turned into a studio for the three days 29-31 October 2005 and the result from The King's Consort new home is impressive; the concert having been something of a rehearsal for this Carolyn Sampson showcase. She has had a publicity workover for the Hyperion cover and inset photos, which not everyone will think appropriate to a sacred music CD, but I was glad to see that Hyperion has retreated from the hype in the concert programme and in the Gramophone advert, and claims, perfectly fairly, that she is "widely regarded as one of the leading British sopranos of her generation". The CD is reviewed by our vocal/opera specialist, who was not at the concert. This recording was made at the Cadogan Hall in the days following the concert reviewed above and provides an expanded selection of Mozart's sacred music. Whenever anthems contain strings of alleluias one can be sure that the church is in euphoric mood, and this collection is crammed with just such pieces. Add to this the happy occasion of Mozart's anniversary year and the listener has every right to expect a rapturous outpouring of musical rejoicing. Sadly there are no thrills here. Everything is handled with musical care and accuracy but there is little sense of excitement, certainly not the exultant jubilation that the title would imply. Part of the problem seems to lie in the rather woolly enunciation. Church latin is amongst the easiest of languages to sing, and those words really need to ring out to express the elation they contain – a bit of a mumble can never become a joyous exclamation.